Mauritius is one of the best and versatile surf spots in the world. Whether beginner, advanced or pro, any surfer can find the most suitable surf spot here, just a couple of hundred meters apart from each other around the peninsular Le Morne. If shallow water for Kitesurf and Windsurf beginners or Freestyle training in the Kite Lagoon, small waves within the reef for advanced or one of the waves like famous One-Eye for the pro`s, its all at your choice. 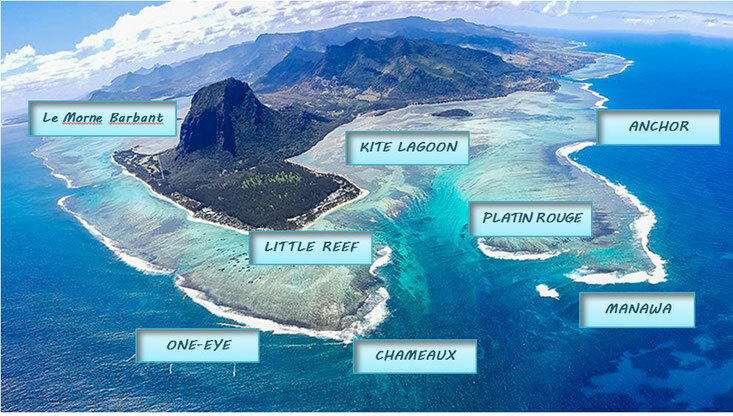 Those who need wind for their passion can profit from the 556 m high Le Morne Barbant, creating a convenient seebreeze in favour for our sport. By the way, the name One Eye arose because you can see from that spot through the eye of the face in Le Morne Barbant. Early morning before the wind is starting to pick up there are several waves for surfing or SUP around. Beginners can profit from Little Reef, a nice rolling and not so powerful wave in beach area. Manawa or One-Eye and Anchor have more power and it is advisable to rent a boat for transfer to the waves, especially for the way back when adrenaline is gone and the muscles are just not listening any more. Boats are available and especially affordable upon demand. In below thread you might find more detailed information about the spots, posted by our clients! In below thread you can share your personal experience on a surf spot around Mauritius. This gives other surfers the opportunity to gain from you and be well prepared for their own adventure. Try to use English language. Even if it’s not your great ability, the message counts not the grammar. To keep an overview, use a headline containing the category (Surf, Windsurf, Kitesurf, SUP) and the surf spot as detailed as possible. Explain a bit about your surf level and the gear you used. That’s it, please go ahead….! Hi, looks like I am the first one here :) but I think it’s a great idea. Hope I do everything right. Actually I came for Kitesurfing to Mauritius in April this year (2018) but the wind starts normally not before about 0900 o’clock in the morning so we went out quite often to surf in the early morning.